Happy Sunday, ya'll! What a blur these last 2 weeks have been (I skipped one week of these posts) - but they were filled with so much fun and happiness! I talked about it for quite some time, but last weekend my best friend got married! Above you'll see pictures of the bridesmaids and a picture of the bride and I on her Vietnamese wedding. She had two gorgeous ceremonies: a traditional Vietnamese wedding last Friday, followed by an American ceremony last Saturday. 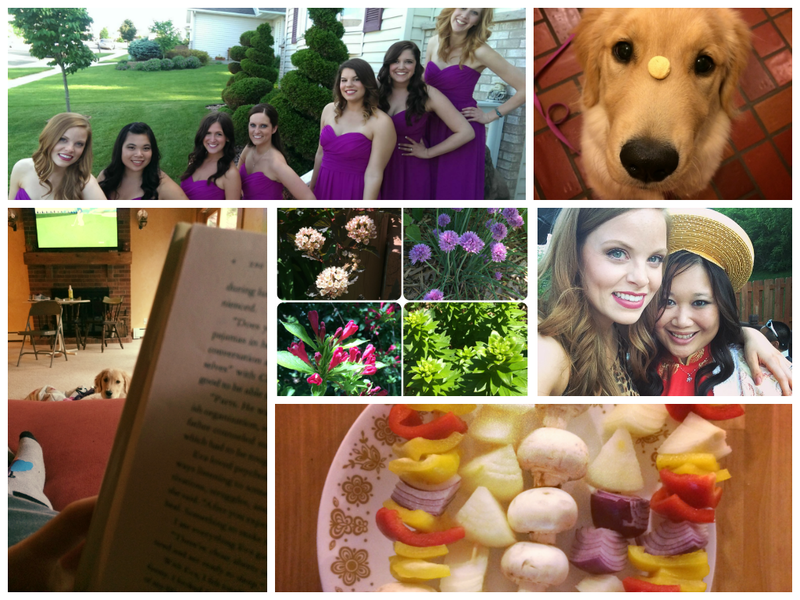 I was so thrilled to be her matron of honor, and honestly her wedding was the BEST time ever! I want to go back and do it all over again! The week after her wedding, I spent a lot of time trying to catch up but the week was still a whirlwind. Winnie had her second Puppy 2 class which was a lot of fun. She's learning to go through tunnels (an intro to Agility class) and we're trying and trying to get her to learn "heel" but it's proving rather tough, despite what a smart girl she is. I'm sure she'll get it in no time. One of the most exciting things about this week was receiving our first CSA box, or farm share. The boxes start out rather small, but we got a delicious haul of asparagus, rhubarb, a couple different kinds of lettuce, cilantro and some yellow onions. We've eaten nearly all of it already! I can't wait to see what next week's box will have - one thing is for sure, it will be fresh, local and organic! All three are a win! I'm nearly finished reading my book (seen above) and I can't put it down! I'm currently reading Breaking Night by Liz Murray. I had the pleasure of hearing Ms. Murray speak last summer and she has such an inspiring story about going from homeless to Harvard. I absolutely had to pick up her book, and let me tell you - it doesn't disappoint. I'd highly recommend it. This weekend is being spent with family as we celebrate Father's Day with both Jake's father and my own. On top of that, we're squeezing in tons of cleaning and load after load of laundry as all chores were put to the side during these last couple busy weeks. Boring, but someone's gotta do it! See you all on Monday! Enjoy the rest of your weekend!